A truly modern wood finish is acrylic urethane. I first used this type of clear finish 10 or more years ago. At that time most painters were apprehensive about using something new, especially when finishing stained wood. Since then many improvements have been made. Let’s take a look at this finish from 10 years ago then today and compare the differences. You will notice that it simply has become better. This finish is my favorite for ease of use, fast drying and low odor. In the past the preferred application method was with an airless paint sprayer. The finish simply dried to fast for brushing, just like lacquer. The very fast drying made it impossible to easily touch-up. Had a milky look when wet, but dried crystal clear. This was scary at first and took a few jobs to get used to. Low UV stability. Although excellent for most interior applications it couldn’t be used outside. Plus, any interior surface receiving a lot of sun exposure needed another product. This was especially true for windows. Excellent flexibility and scratch resistance. Unaffected by short term exposure to water and mild household chemicals. Low odor and water clean-up. Today’s acrylic urethane still has some of the old attributes, but with significant improvements. Most improvements have come from the increase of different manufactures. Now almost every brand of paint manufacture offers a water-based wood finish. Excellent brushing qualities. This is dependent on the manufacture, but great strides have been made allowing for better flowing on the surface. Plus, some brands are considerably thicker allowing a faster build of the film with fewer coats. Fast drying. All the types I have used still dry fast to the touch. Typically 30 minutes or less depending on the temperature and humidity. Recoat times can be 30 minutes to 2 hours depending on job site conditions and manufactures specifications. Excellent flexibility and scratch resistance. You don’t need to worry about light scratches or the finish cracking. Many brands can be used on hardwood floors with great results. Drastic improvements with UV stability. Many brands are rated for exterior use. Allowing this type of wood finish to be used on interior windows or exterior doors. Usually exterior rated products have a semi-gloss or gloss sheen. Resistance to water and mild cleaning chemicals has been improved. I have used a finished piece of 1×4 wood as a coaster with a glass of ice water. After a week of the glass “sweating” no adverse effects happened to the finish. Dries crystal clear without an amber affect. This type of wood finish dries without adding any color to the wood. All oil base products add a amber color to the wood when applied. Multiple sheens available. The sheens available range from eggshell to gloss. Just like paint, each manufacture has their own ideas about what is a specific sheen. If you need a particular sheen, test before buying. Most paint stores will apply a small amount of the acrylic urethane to your sample. Can be used over water based paints and delicate finishes. Some faux finishes and specialized paints, such as stone paints, can benefit from the extra protection. This especially applies to bathrooms or other wet areas. Low odor and water clean-up. Acrylic urethane has a very low odor and isn’t flammable like oil base wood finishes. This makes it a great choice for winter interior wood working projects. Plus, no need for flammable solvents. Just use clean water and mild soap for cleaning your tools. Although these features can vary from manufacture to manufacture, they still represent the impressive capabilities that acrylic urethane has to offer. 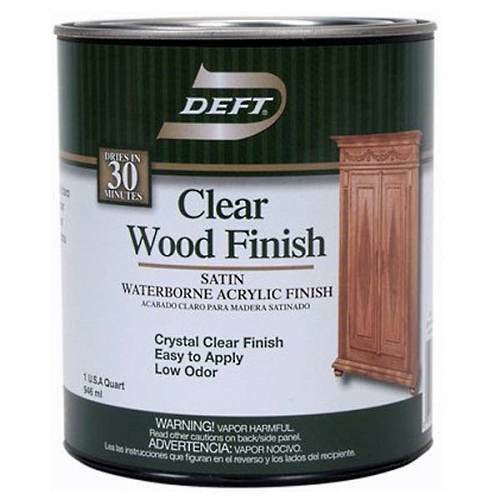 This is a great choice for all interior wood staining projects and some exterior ones as well.